Journal – NFPF/NERA, the main association for educational researchers in the Nordic countries. Nordic Studies in Education was earlier known as Nordisk Pedagogik. 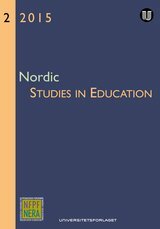 Nordic Studies in Education mediates articles, information and debate on topical subjects within education in the Nordic countries. By means of research articles and vivid debate and through information on topical professional issues, educational problems are presented from various social-science and historical-philosophical points of view. The journal is a source of information on the various research environments and a directory for publications, conferences and other events. Nordic Studies in Education is published in collaboration with Nordic Educational Research Association and with financial aid from Nordic Board for Periodicals in the Humanities and the Social Sciences and is directed to educators and researchers and others interested in the field of education.Nordic Studies in Education is published quarterly and accepts contributions written in the Scandinavian languages and in English.